are vital moments for any patient. Make sure the A2D folder is passed on! can be complex for patients with disability. The A2D folder can smooth the process. 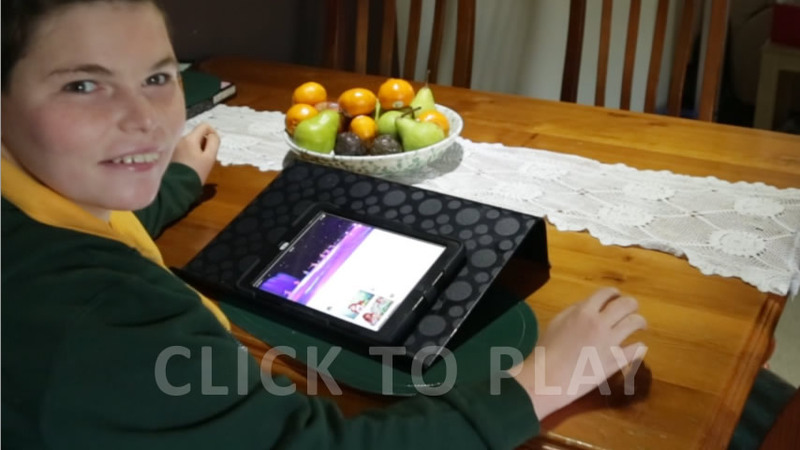 Watch how the use of the A2D Together Folder helped Bruce receive the best possible care after a fall at home. Health services staff from first responders, hospital admission right through to discharge, all use the folder to deliver better care and a better health outcome for Bruce. Discover how the A2D Together Folder can help you when you are sick or in hospital. Do you care for a person with a disability? Want to find out how the A2D Together Folder can help with a hospital visit or help when visiting other health related services? See how the Admission2Discharge Together Folder can improve the hospital journey for people with a cognitive disability as well as assist in the provision of person-centred care. See how the Admission2Discharge Together Folder can support your clients by helping smooth their hospital admissions and medical appointments. Bruce has taken a tumble and the paramedics have been called. Watch this video to see the A2D Together Folder in action. 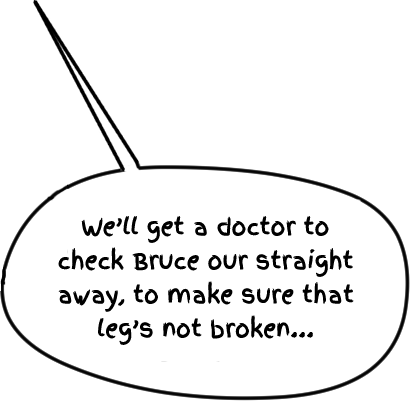 The A2D Together Folder helps transfer Bruce’s information from home to the paramedics and then onto the hospital staff. 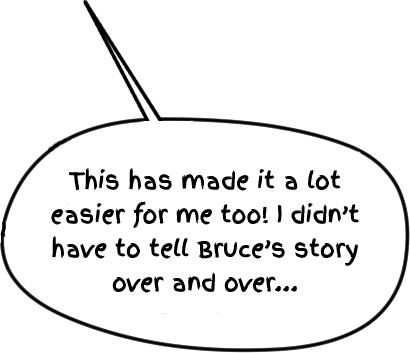 Bruce’s TOP 5 includes information about how he communicates, and helps the hospital staff look after Bruce and provide person centred care. The A2D Together Folder provides nursing and medical staff with important information about current medications and treatments. Bruce’s TOP 5 highlights his special diet needs to reduce his risk of choking. 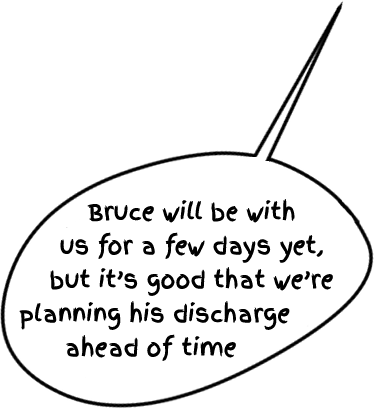 The A2D Together Folder helps hospital staff speak to Bruce’s Disability Support Staff and plan ahead for his discharge. 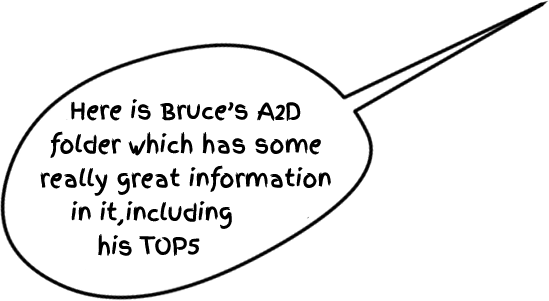 The A2D Together Folder returns home with Bruce, is updated if required and then is ready to accompany Bruce if he goes to hospital again. “For people with intellectual disability and those who support them, the hospital journey is often complex and stressful. The A2D website is a high quality resource with significant capacity to improve this journey for people with intellectual disability. 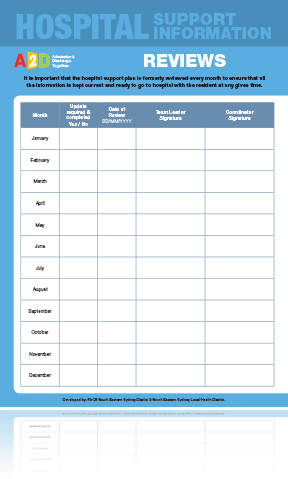 It contains extensive information for the person, carers, health professionals and disability workers which will assist in the collation of a practical resource folder. This resource is a catalyst for substantial practical changes in the way in which the person, their carers, health and disability professionals interact and exchange information. These practical changes are further supported by a rich collation of training materials which promote improved healthcare for people with intellectual disability. The A2D team are to be congratulated for this ground breaking work. What makes up the A2D Together Folder? Below are elements from the four parts of the A2D Together Folder. Click through the slides to read about what information is in each section of the folder. Click on the find out more buttons for more information about each one. Record the person’s name and attach a photo of the person when they are well. Record the name and contact details of the of the person's legal Guardian or Person Responsible. If the person is unable to give medical consent, this helps hospital staff to easily and quickly contact the person who is able to make medical decisions. Write the date the folder was last updated and who updated it here. This lets the hospital staff know that the information is current. 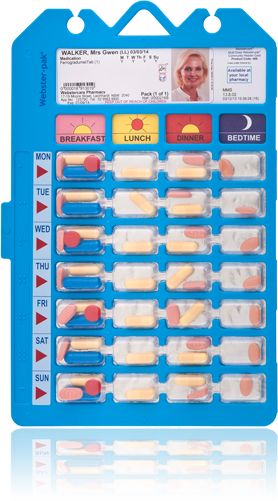 Include a copy of the current medication chart (if you have one) and the current Blister Pack. Don’t forget to also take any liquid medication, patches and inhalers the person uses. This tells the medical staff about the person’s current medications and helps them order medications for the person while they are in hospital. 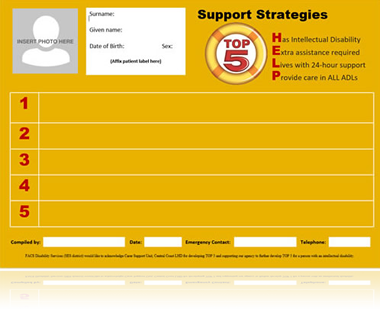 The TOP 5 helps the staff caring for the person in hospital be aware of the persons specific needs. 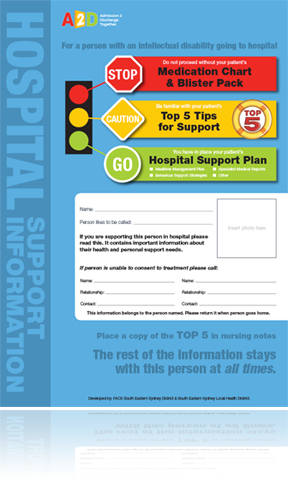 TOP 5 is a tool to provide care tips and unique information about the person you care for, to assist care staff to better understand the person and his/her needs. These include communication abilities, their likes and dislikes, rituals and triggers. This helps the hospital staff provide person- centred care. Part 1 should be completed by the person with a disability, the carer and with the local GP or the disability support staff. It contains current and relevant medical information. Part 2 is completed when the person is in hospital with the Nurse Unit Manager (NUM) or Nurse in charge to help plan for discharge home. 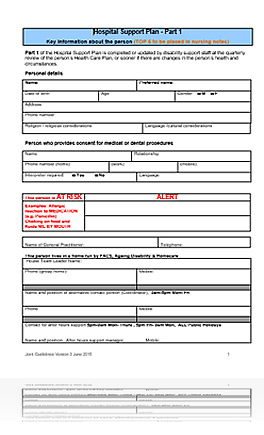 This provides current and relevant medical information to the hospital staff when caring for the person with a disability. It supports early discharge planning to commence when they are admitted to hospital. for the A2D Together Folder and its use? Purpose and benefits of the A2D Together Folder. What patient-centred care means and how personal values and attitudes may impact on the support provided. Note: It is recommended that the education session provided be co-facilitated by a representative from both the Health and Disability Sectors. 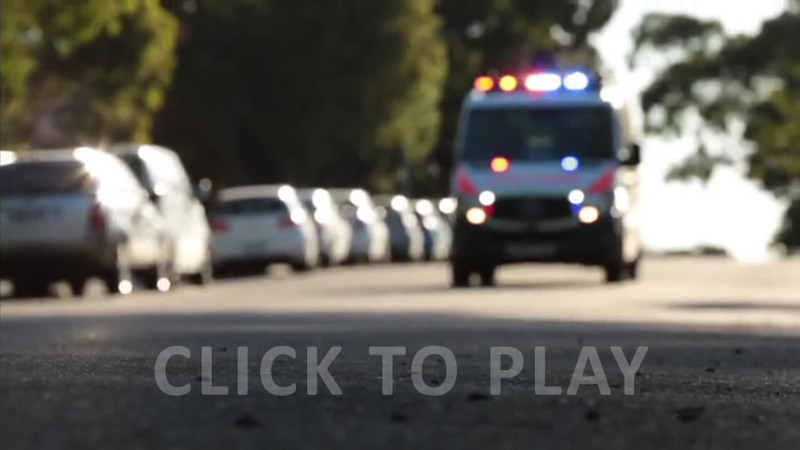 The “Going to Hospital” training package is available to any NSW Disability Service provider wishing to train disability support staff in implementing the A2D Together Folder and to enhance the skills and knowledge of the Disability Support Staff. This training is designed to be facilitated in a 2-3 hour session.